I read that earlier and was much dismayed by the reported comments from Cardinal Burke. it is unbecoming for a prelate to tell fibs (that the SSPX is in schism) which contradict his brother Bishops. Ironically, he would never say such a thing about genuinely schismatic groups, such as the Eastern Orthodox churches. How disappointing that he is so feeble in the face of Francis, yet so bold with unprovoked attacks on faithful Catholic groups, attacks based on deceit. I am very disappointed in him and have diminished respect for him now. As if attacking the SSPX should be on his agenda, while everyone is waiting (and waiting and waiting) for him to act on the dubia. I had thought Cardinal Burke was one of the better Cardinals, but I am very disappointed with his claim the SSPX is in schism – which is demonstrably false. I had considered him as one of my big hopes for Pope, once Our Lord in His mercy finally grants us release from Francis. I am very much reconsidering that point now! Recently I read that Francis has reappointed Cardinal Burke to the Apostolic Signatura, albeit in a more minor role than the one Francis previously removed him from. Perhaps this reappointment also explains why the long awaited fraternal correction just never seems to arrive? Maybe Cardinal Burke is happy to make peace now that two of his fellow Dubia Cardinals have died, and the other (Cardinal Brandmuller) is pushing 90? I hope the Cardinal is big enough to retract his comment and apologise. I certainly hope Bishop +Fellay protests, or that Ecclesia Dei speak out (fat chance on the latter). We shouldn’t be surprised at all this, one Cardinal saying one thing and another saying the exact opposite – it’s the way the Church is now. I must say, I certainly would have thought twice about returning to Church (in my late 20’s – a frighteningly long time ago now) had I known how contradictory and faction riven it is these days. It is so exhausting and unedifying. I went to the Pontifical High Mass in Balornock and, despite being unimpressed by these new comments, I would go to the mass again tomorrow. Attendance at any mass saying nothing about your stance on the priests own erroneous opinions. I went because I had never been to a Pontifical High Mass before, and I could live to 80 and never get the chance again – this is mainly why I went. (Of course I did have a much higher opinion of the Cardinal then, also). I would like to ask Cardinal Burke if he thinks I did the right thing by moving to the SSPX Church, where we get authentic liturgy and sound doctrine, or would he say I should have stayed with the Jesuits where I learned nothing and whose main priority today seems to be overturning Christian sexual morality (as evidenced by Francis, champion of adultery, and Fr James Martin Eth Jay, champion of homosexuality). A parent of a growing family said to me just a couple of days ago, that there is just no way she could take her children to a Summorum Pontificum parish on a regular basis: for all the talk of these priests being “traditional”, for example, they still set out the poisonous Catholic papers every week (as she said: “it’s the first thing you see on entry”) and implicitly, in various other ways, they support the revolution. I take your point about desiring to experience a Pontifical High Mass – I would, too, but things are just beyond bad now, beyond serious, that I am increasingly conscious of the need to just refuse to support the revolution in any way. Mind you, having been effectively banned from attending the Cardinal Burke Mass (for that is what it was!) my vision may be somewhat blurred – I happily admit the possibility! I just KNEW that CT would pick this up! I agree with Gabriel – it’s very disappointing that H.E. would say such a thing. You can’t make up this stuff – truth really IS stranger than fiction. And another blog had the SAME clip from The Godfather Part II (which I DON’T recommend watching – the series is totally unsuitable for family view [and that’s the most charitable way I can put it]). P.S. Prayers requested for all the dead and injured in Las Vegas. Ed I love blogging and its still out there the Downright Hatred for our Faith as you well know. I think that all this toing and froing of Cardinal Burke is to set the tone for a complete Ban on The Traditional Mass . If that is what does happen then without doubt there will be Schism. It’s bad enough being assaulted by outsiders without the Verbal Boot ( just for the moment anyhow) being put in by supposedly Princes of The Church . There was an article about Francis wanting to take in more Refugees ( what a surprise) which I went on and got in discussion with a ” Christian ” of what Faith she wouldn’t say . Others came to her let’s say assistance and the hatred towards our Faith was well Normal really. One thing struck me about this Lady was her Utter Hatred for Our Lady . There were certain things in her posts which led me to believe she was once a Catholic ( of which I asked ) silence nothing back . The old saying has never been more truer than now within our Faith. Our own kind are the worst. What a statement from a Mother of a Catholic Family. Ed i go to both N.O. and Traditional Latin Mass as maybe do lots of Catholics. Since going to T.L.M I know that there is really no comparison. Please do not take this the wrong way and I hope you live till your 100 . But last week talking after Mass with our Priest . He told me he was going to say T.L Requiem Mass for a Parishioner in Newmains as the man had requested a Latin Requiem Mass in his will . So it’s certainly something I want also. Not just now though not just now . I was just wondering did you know of this ,not the man about leaving that request in Ones Will . I agree. What a statement. There’s not many mothers who would go to such trouble to protect their children from even the slightest contamination of modernism/liberalism, so she is to be warmly praised. Putting the request for a TLM in your will, doesn’t make any difference. It has no legal weight. The law cannot enforce that wish, so you need to make sure your family, who will be arranging your funeral, know that you want the traditional Mass. I agree with your parent-friend – those poisonous papers put me off too. My children are excellent readers so if I turned my back for a couple of minutes they could easily read something on those comics! A lot of us thought Cardinal Burke was one of the better cardinals but that just serves to prove how standards have fallen. At one time, any cardinal would have known the difference between a schismatic and the SSPX situation. I’m afraid he’s way down in my estimation now. Here we have another instance of the hierarchy speaking with a forked tongue. According to the response to a dubium submitted to the PCED on this matter, the faithful were advised that as long as they did not assist at SSPX Masses with a “schismatic intention”, whatever that is, then they could indeed fulfil their Sunday obligation by so doing. As the SSPX acknowledge Francis and his predecessors to be legitimate Popes, have no intention of denying this fact to my knowledge, and are actively involved in seeking a solution to the matter of regularizing their position, I can’t see how the word “schism” is in any way appropriate. I have absolutely no qualifications in Canon Law whatsoever, so readily acknowledge that these questions are way above my paygrade, however, the Pope does not seem to regard them as “schismatic”. On the downside, bearing in mind that the Pope’s private opinion counts for nothing, and bearing in mind who the Pope is…. As far as I am aware the granting of faculties to hear Confessions and Solemnize Marriages has no basis in Canon Law apart from the Pope’s will to do it. Below some basic information on the SSPX “schism” taken from the website of the USA District: with one exception, I have not included the links given at source. Link to source at end of this post. “The Society of St. Pius X has always recognized and adhered to the authority of the pope, and, as noted by prominent Roman authorities (e.g., Cardinal Castrillon Hoyos), the SSPX is not schismatic. Was Archbishop Lefebvre (along with his co-consecrator and the four bishops whom he consecrated) excommunicated also for having done a “schismatic act”? A first argument to this is given under the heading: Wasn’t Archbishop Lefebvre Excommunicated? Do the faithful, threatened by Pope John Paul II himself with excommunication if they adhere formally to the schism (Ecclesia Dei Afflicta, July 2, 1988), indeed incur any excommunication for going to SSPX priests for the sacraments? Not at all. The priests of the Society are neither excommunicated nor schismatics (as figures such as Cardinal Hoyos have made clear) that the Society is not schismatic (Is Tradition Excommunicated? pp. 1-39). This being so, how could any of the faithful who approach them incur these penalties? Weren’t several laypeople excommunicated in Hawaii for attending an SSPX Mass? That Cardinal Burke is ignorant of these basic facts, speaks volumes. While not wanting to speculate or assume the worst, I think this comment above may be a generous analysis. Oftentimes people (inc clergy) who do know better still say false / negative things about the SSPX, due to politics / agendas. It would seem remarkable if Cardinal Burke didn’t know at least some of the examples you list above. Even humble lay people like myself (!) have access to the facts, if willing to read books or spend a short while researching online. How then could an important Prelate be ignorant of the situation? Even if we assume the Cardinal was speaking from ignorance, then surely he should have been prudent enough not to “weigh-in” while not being in possession of the facts? Unfortunately, these comments will give plenty of ammunition to Michael Voris, and those of his ignorant ilk, who are only all too eager to take advantage. Nail on head – Michael Voris will be thinking that all his Christmases have come at once. How infuriating. I’m SO glad I don’t receive his emails/videos any more. “Insufferable” is the word that springs to mind. So it seems to me that Cardinal Burke was way out of line to say what he said. In other words, we don’t call the REAL schismatics, “schismatics” but we can call those whom Pope Francis described as [real] Catholics “schismatics”. Truly, you could not make this stuff up! Up, this stuff you could not make! I have just been speaking to Christina on the phone. As you will all remember, she was hospitalised some time ago for major surgery. She came through that surgery well and returned home to recuperate. Unfortunately, she then fell and broke bones and had to be taken back into hospital. She has now suffered further complications and is in a great deal of pain. Please remember her in your prayers. I told her that I would ask this, and she was very pleased. Our Lady of Lourdes, Health of the Sick, pray for her. I am keeping Christina in my prayers from now on – she has had a terrible time, by the sounds of it. My love and prayers to her. Yes, Poor Christina has been through the wars recently. I will certainly remember her in my prayers. Poor Christina! What a miserable time she is having. Please assure her of my prayers and sympathy. Sorry to hear of Christina’s fall, please pass on my regards and assure her of my prayers for a good recovery. Ach well, at least we can stop deluding ourselves now. It is quite clear that the revolution has taken hold of everyone and everything in the post conciliar church. I am obviously disappointed in Cardinal Burke, but should I be? Let’s be honest about this: have we been clutching at straws? What is interesting about the clip (is there a link to the whole recording?) is that in all his canonical legal brilliance, he does not raise the question of supplied jurisdiction in the context of this talk. For Catholics who are set uneasy by this clip, especially by his use of the phrase ‘not a good sign’, Cardinal Burke is being uncharitable at the least and downright neglectful, not to openly consider the proposition to give a balanced perspective. You are absolutely right about “clutching at straws” – that is a real tendency (and has been for many years now) in this crisis. Yes, the Cardinal’s response was impoverished by any standards, but from someone who is an acclaimed canon lawyer, it is dishonest in the extreme. Summa, I didn’t watch the first video because it was a bit long but also because I don’t rate Fr Kramer at all, but thanks for posting the Fr Gruner video – that’s great. It should be obvious to any serious Catholic that the SSPX is not in schism, so at this stage, I would just say to anyone who thinks the Cardinal is right, good luck to you. Absolutely! You are on the button, as ever! …and thus the unfaithful hierarchy did disgust and drive most of the faithful out of the churches and now most of the them are closed. It’s not like him. I’m flabbergasted! Who knows what kind of diabolical pressure has been placed upon his back. Maybe he HAD to say it to make a gain. His saying it means nothing. I see it as uncharitable too. Look at how the other Cardinals of the Dubia are! Dead! Pray and wait. Sacrifice. Fast. All the things Our Lady asked of us. God is still in charge. Maybe Our Lady appeared to him. Why wouldn’t she? He is so quiet and then comes out with that??? Strange. That is a good observation and ties in with my thinking lately that conservative Cardinals, like +++Burke, seem more concerned with “keeping up appearances” than they do with fighting for orthodoxy. Hence, the fixation with others being seen to be obedient. The likes of Fr James Martin etc run riot in the Church, but get away with it because they are happy to wink at fidelity and obedience, when required. But because the SSPX raises issues and takes a stand over them, they get panned because they wont make a big showing of caving in when required. Probably the Pontificates of both JP II and Benedict XVI could be well understood. if viewed with the understanding that “keeping up appearances” of a unified and obedient Church loomed large in their thoughts. This outlook is toxic and is in fact perpetuating disharmony in the Church. Look at how, for example, Bishop Athanasius Schneider has called for a syllabus of errors to be drawn up regarding the V2 documents. He clearly wants to get to the bottom of the issues and dig out the rot. Whereas +++Burke does not seem to want to do this, and instead – like so many – seems to be happy to insist the documents must be understood in an orthodox fashion. But it is not sufficient to insist on this, if the documents can be understood in any fashion other than an orthodox one, then they must be discarded or fixed. The fact this has not yet happened indicates both a preoccupation with appearances over clarity among the hierarchy, to say nothing of pride (it would obviously be quite humbling for the Church to have to come and say it’s own documents are flawed). As for +++Burke, I think the twin developments of his return to the Apostolic Signatura, coupled with his sudden deceitful attack on the SSPX, are concerning. They suggest a man who has been bought. Alternatively, maybe he has attacked the SSPX because he regards Francis overtures as being another undesirable move by the Pope. But i would doubt that and in any case he has much better ammunition to attack Francis with. It’s a kind of mince with potatoes. That’s how I explain it, to save people the gory details, LOL! It seems Cardinal Burke can’t work out even the basics in this as he considers Pope Francis’ extension of marriage and confession faculties to SSPX priests as “anomalous”. The simple fact is that Pope Francis could not have extended such faculties to the SSPX if it were truly a schismatic organisation, and Cardinal Burke knows this better than anyone else. So why is Cardinal Burke so keen to downplay this very significant recognition by the Pope, especially as it favours Tradition? Could it be that His Eminence has a guilty conscience? After all, he remained silent for fear of persecution when Archbishop Lefebvre and the other SSPX bishops stood tall in the face of revolution in the Church. I rather think this is at the heart of Cardinal Burke’s discomfort, though it does not excuse in any way his completely false declaration. All he has succeeded in doing is add more guilt now to his own conscience. No wonder the Church is in such a mess when the likes of Cardinal Burke, a prelate in the middle of the road (fence sitting) is hailed a great prelate of Tradition. I am increasingly of that opinion, but hope to be wrong. Several signatories of the filial correction and various blogs are urging him to do it – hopefully he will, even if only because he has been shamed into it. One Peter Five has an interview with a Professor Pierantoni, who signed the Filial correction. The formal correction, as you remember, was already promised for January. But in April, when we had the Rome conference, there still was no hint that Cardinal Burke was going to issue a correction. So, in a little group, we started to think about a lay correction. Then, in July, when our correction was taking its final shape and had gained a certain number of signatures, we heard with great pleasure that Cardinal Burke was again thinking of a correction on his part. The bit in bold is concerning, as it suggests that +++Burke had already binned the idea, before being re-enlivened by the academics own effort. Perhaps he had been discouraged by a lack of support from other Bishops? He has in fact given us hints that he approves of our “filial” initiative and feels supported by it, and so I’m sure he now knows that very soon is his time to act. Perhaps two or three more cardinals, or half a dozen bishops, will join. Maybe more, maybe less. But even if he were the only one, I think he must soon issue a correction. Which is more encouraging and seems to hint that +++Burke may even have rallied some support for the move. I think you may be correct. The game’s a bogey. I read somewhere the other day that Cardinal Burke said he did not want to go to his grave with not having corrected AL on his conscience. Well, we’ll see if His Eminence can summon the courage. Frankly, everyone is tired now of Cardinal Burke threatening to do eventually what should have been done immediately. I don’t see it happening personally. After all, the Cardinal was silent for decades on all those abuses affecting the Faith. I agree. Cardinal Burke has made himself into a type of “boy who cried wolf.” But I am also wondering, given the circle of corrupt thugs that surrounds Francis, if he has received death threats warning him against publishing his correction. Don’t forget that two of the Dubia Cardinals – Carrara and Meisner – are now deceased after being in relatively good health. Also, many Catholic blogs reported that Cardinal Mueller thought that he could do more good in the Vatican until push came to shove earlier this year. I don’t know the mind of Cardinal Burke, but aside from the fact that the Pope ordered him to come back. maybe he thinks that he can do more good in the Vatican. His Eminence needs prayers. Lord, have mercy! If such were the case then I’m afraid the Cardinal, like the martyrs, would have to choose death rather than the dishonour of silencing the truth. I think no matter what the circumstances, the truth has to out, especially when their is grave danger to souls. No one would castigate Cardinal Burke for bringing this to a head: I mean how much time does Pope Francis need? The answer of course is none. He will not answer the dubia because he knows that there is a good chance it will fizzle out, especially if he has silenced one of the original architects. We hang on. We resist. We remain the same. Having just watched the Michael Matt RTV piece on this, I think Mr Matt has taken the sensible line here. No knee jerk reactions (like me most of the time) – however in this case my ‘clutching at straws’ comments above, were for once accurate. Cardinal Burke is a product of the Conciliar Church and a Leader of its adherents. We ought to pray for him. But we shouldn’t be surprised. I think the bottom line is the Cardinal is part of the modern Church and gets the name of being traditional really just because he says the Latin Mass from time to time. I agree that we shouldn’t be surprised at this news, but it is disappointing when so many of us had high hopes in him. Michael Matt is a tad more charitable than I!! What is your opinion of this video? Why do you say that Michael Matt is “a tad more charitable” than you? Do you agree with the substance of what Michael Matt is saying about his “buddy, Cardinal Burke”? What is “a Remnant traditionalist”? -Get a conversation going? You mean there aren’t already thousands of conversations going, and much more serious ones than the usual “Can’t we all just get along”? -How about prayer and penance instead of more conversations? -If Cardinal Burke is a “Pope Benedict guy,” why does he think the SSPX is in schism? Did Pope Benedict say that? -Saints on both sides of the SSPX debate? Name one, other than Abp. Lefebvre! -Look for clergy who will give us a smidge of tradition???? To work with them because they have “kept the Faith”? Another variation of “Can’t we all just get along?” and a false idea of what “keeping the Faith” is. -Cdl. Burke a fellow traveler? Not hardly. Pray for him? Certainly! -Where would we be if we didn’t have the Dubia? Same place we are now: nowhere. The Dubia are dead, just as dead as two of its signers. Has that document inspired others? Yes, but with zero authority. -Cdl. Burke may indeed have the weight of the world on his shoulders, but that weight has ground him to a halt. -What is a Remnant traditionalist? (as Editor asked of you) A purist? If a purist, then why is The Remnant looking for clergy who are willing to merely recoup a smidge of Tradition? -Cdl. Burke is no longer resisting Pope Francis to his face. -What sort of “strategy” is this Catholic Identity Conference going to develop that will end the revolution? A strategy developed by those with no power to end it, except prayer and penance? -MM assumes that Cdl. Burke is still working on the formal correction. I hope he is “correct”! -Cdl. Burke is moving in the direction of tradition: how? What evidence is there of this? I completely agree with your statements about Michael Matt in the video above. He has been weakening for quite a while, and he seems to be just fed up of the whole fight. That’s a pity. Your last question is one that does need answering – what evidence is there that Cardinal Burke is moving in the direction of tradition. None that I can see. Oh dear, I’ve requested a month’s leave in order to try and answer your questions! Those are really questions for Michael Matt and his fuzzy thinking. Save your vacation time for when the Consecration is done – then take a month off to celebrate! Naughty. You can at least take the time to tell us if you agree with Michael – A-Foot-in-Both-camps – Matt, or not. No, I don’t agree with Michael and I do think his thinking is not clear on this matter. However, I do have some sympathy with his opinion of Cardinal Burke in that we must see some good in his position as in others of the same ilk. Michael is somewhat naive in this matter and he is, as said above, looking at the Cardinal through rose coloured glasses. I do feel that too many people still think we can still sort out this mess ourselves, which is not possible. I also sometimes get the feeling that too many people have too little trust in God, despite the fact that we have been told that all these things must come to pass. I know….too many ‘toos’ but never mind! I tend to agree with RCA Victor. I understand where Michael Matt is coming from but I think he’s looking at the Cardinal Burke situation through rose coloured glasses. The bottom line in all of this is that Cardinal Burke is bound up and gagged by an exaggerated obedience to the Pope. This renders him not only impotent in the fight for truth, but an unwitting enemy of it. The latter danger consists in the fact that many Traditional Catholics hold Cardinal Burke to be a champion of the old Mass and of Catholic orthodoxy. The latter, sadly, extends no further than the Church’s moral teaching, it has never included that essential resistance to doctrinal corruption which is central to any true fight for the restoration of all things in Christ. Has anyone, for example, ever heard the Cardinal speak out against the condemned errors of religious liberty, ecumenism and inter-religious initiatives? For that matter, has anyone even heard His Eminence speak out against the dangers of the New Mass and its blatant Eucharistic abuses of Communion in the hand and extraordinary ministers of Holy Communion? No, Cardinal Burke is by no means the hero of Tradition that many imagine him to be. He is very much a disciple of Benedict XVI’s flawed “hermeneuitic of continuity” theory, which, as we know, aims at legitimising a less radical Modernism in the Church through coexistence with an equally moderated Traditionalism. Of course the two are diametrically opposed and irreconcilable, but the difficulty is that it sounds convincing and it lets Catholics of all ranks in the Church off the hook when it comes to their duty to uphold the Faith in its entirety. This has been the problem all along with the likes of the LMS, Una Voce, FSSP and other such middle of the road Traditional institutions. As long as Rome gives them the old Mass and a restricted liberty to practice the Traditional Faith, they are content to remain silent while the rest of the Church goes to Hell in a handcart. This is not the spirit of the saints and martyrs, it is the spirit of compromise with error and it results in undermining the efforts of those who stand firmly against Modernism in all of its poisonous manifestations. The SSPX alone has taken this latter stance, hence it alone has been persecuted from all sides. Now Cardinal Burke adds to the opprobrium heaped on the Society with his unfounded, and frankly reckless, declaration that the SSPX is schismatic. We all know, or should know, where the schism exists in the Church today, and it is not with those who cleave to the orthodox security of Sacred Tradition! While I do recognise that the aforementioned semi-Traditionalist institutions are producing good fruit for the future with regard to the priesthood and the ancient Mass of the Church, this does not excuse their failure as Catholic institutions to publicly deplore all those doctrinal and sacramental scandals in the wider Church. Is it not just typical of the confusing times in which we live that the one Cardinal who all Traditionalists were looking to to speak out publicly against the errors of AL, spoke out instead against the SSPX. It is folly in the extreme to play down the gravity of such a development and its implications in the fight to restore Tradition to the Church. I personally think Cardinal Burke has done more harm by his solitary attack on the SSPX than any number of his fully progressive confreres could have achieved together. Very sad, but there it is. Not only has Cardinal Burke NOT spoken out about the dangers of the new Mass but he continues to say it! Another “traditionalist” keen to keep a foot in both camps. You’re right about that quote from Archbishop Lefebvre, I was just giving the abbreviated version. I find the abbreviated version more poignant. Thanks for quoting the full passage, which reminds us again of the wisdom of Archbishop Lefebvre. I fear we have to disagree on that – I think it’s only when we quote the “disobey the whole of Tradition in the name of obedience” that it hits home. PS I guessed that you preferred “the abbreviated version” since it was YOU who abbreviated it! We do, however, agree on the wisdom of the Archbishop! Now that’s what I call abbreviated!! I’lll take it your choice of word “priceless” means that I won’t be getting a pay increase?? 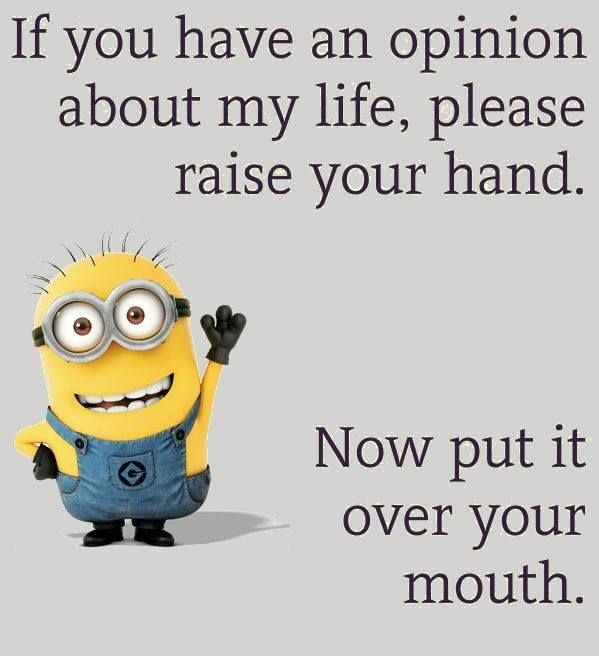 The wee guy in the cartoon suggests you’re also down to your last minion! It’s absolutely a case of great minds thinking alike. I won’t back that up with “it’s a no brainer” in case you get the wrong impression! This sorry episode with Cdl. Burke really highlights the complete impotence of the modern Church. Her liturgy is impotent, since it no longer re-creates the Sacrifice of Calvary; her apologetics are impotent since they not only no longer defend the doctrine and deposit of the Faith but actually turn against it to undermine it; her discipline is impotent since errors and corruption are no longer corrected or punished, but excused or ignored or hidden; her priesthood is impotent because they no longer perform the Sacrifice and no longer have a real altar upon which to do so. It follows that a Church in this condition can not and will not remove the debilitating virus of a wayward Pope from the Mystical Body. Cdl. Burke’s inertia and waffling, therefore, is just an exemplar of this impotence. The Church Militant, in other words, has been buried beneath mountains of secularism, human respect, paganism and the sins of its clerical members. Our Lady gave a Pope the means to perform the complete excavation of our buried Church. I wonder who will use those means? I absolutely agree with the sentiment you express but would be hesitant to say that they no longer perform the sacrifice (of the Mass). Although I completely accept that the New Mass is dangerous to faith by reason of the Protestant theology that surrounds it, nevertheless the words of consecration, if said with the correct intention, do make it valid. And if it’s valid the sacrifice has to have taken place, albeit in a greatly obscured fashion. There is certainly a lack of “force or effectiveness” in the total behavior of the modern Church, and I think Cdl. Burke exemplifies it. I agree entirely, thank you for the clarification. Another obscuration is this novel reference to “the Paschal Mystery”, which pertains to the resurrection of Our Lord, not His suffering and death on Calvary. None of this happened by accident, that’s for sure! All told, this is a very interesting discussion and it is, if anything, a timely and grave reminder for us to be always on our guard. I have always held the sermons of ++ Fulton Sheen in high regard and have found him to be orthodox and conservative (but I’m only a dunderheid). I just want to add, that we are all wrong at times, but God is merciful and his love and justice is unlimited. May ++ Fulton Sheen rest in peace. I know what you mean about Archbishop Fulton Sheen. I enjoyed his sermons enormously and was very, very disappointed to read what he said about the SSPX. ++Fulton Sheen was, as you say, a good prelate but sadly with a weakness for popularity. He was never going to get on the wrong side of the Pope, even if it was in the service of truth. Very sad, but God rest his soul as he otherwise did much good over many decades. I still like his sermons and talks.